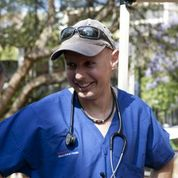 Dr Mark Kelman is one of the nicest guys I've come across in veterinary-land. As a final year veterinary student I worked with his sister-in-law, and met Mark soon after. 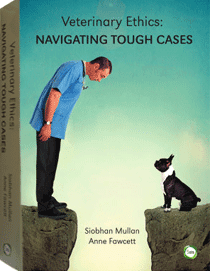 He's passionate about all things veterinary, whenever I talk to him he's training for yet another fund-raising marathon (the guy can run) and he is an absolute delight to collaborate with) we co-wrote a paper on amitraz intoxication in a young dog). 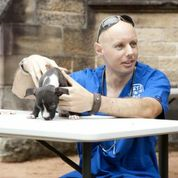 The wonderful Dr K found time to talk with SAT about what he is up to with his veterinary career and a cause dear to his heart, Pets in the Park. Pets in the Park needs plenty of community support so if you're keen to help out, please read on. I'm Dr Mark Kelman, and I do a few different things - to try and sum me up: I'm a vet, I work in pharmaceuticals, I'm also a property investor, an educator and a philanthropist. 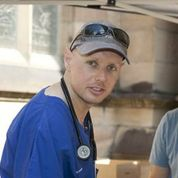 I graduated from vet school in 2000 from Murdoch University, and spent 6 years in clinical practice and loved it. Then I decided it was time for a change and moved into veterinary pharmaceuticals with Virbac Animal Health, where I have had several roles, mainly around Technical Services Management. I have been fortunate to have a very interesting position which includes research in veterinary animal health, including disease surveillance. I also attend many conferences, both to speak and listen. I train people on the science around veterinary health, and write scientific papers, journal articles, for magazines and much more. I also work with the commercial teams and other aspects of the business. As well as my veterinary role, I have been a property investor for the last 10 years. I run my own company, investing in residential property and also teaching people how to get started in this field. I am a strong believer in sharing knowledge and truth. In the world today, having one profession may not be enough and I am passionate about people being well informed about investing and financial education. I have written a book that is just being released in the next months and also run seminars in Sydney on this topic. More info on this side of my work can be found at www.achieveproperty.com. Lastly, I try to be involved as much as I can in philanthropy and charities/volunteering. I think this is an important part of our world as there are many who are not as fortunate and we are all here to help each other. I am lucky that through my various careers and investing I can use my skills and resources to try to find ways to help others. I always wanted to be a vet. I remember being 7 years old and in primary school standing on stage as we all told the assembly what we wanted to be. My twin brother went up first and said he wanted to be a vet. I had exactly the same feeling. We were both lucky enough to get into vet school and graduate into this career. In particular my passion is companion animals - our canine and feline friends, and big cats which I think are pretty amazing. You coordinate Disease Watchdog. What does that do? Disease WatchDog is Australia's national disease surveillance system for pets (cats and dogs). Sadly, often our companion animals are overlooked when it comes to medicine and research, and there are some very common diseases that a lot of people aren't aware of. Researchers often look at the interesting (one-in-a-million cases) diseases, but we overlook diseases that can affect thousands or even tens of thousands of pets every year (in Australia alone!). Some of these diseases can be fatal and most are almost completely preventable. I designed and launched Disease WatchDog in 2010, and we run a web-service database that vet clinics record cases of disease into. We can then track disease cases and outbreaks and use the data to do research trying to find ways to stop disease before it happens. We also use our information to help communicate on disease risks and outbreaks - advising the public and vets about risks. You can view information on the system at www.diseasewatchdog.org. There is a smart-phone friendly version that will display on Androids, iOS etc and this is available to the public. Vets have their own log-ins that they use when entering case data. We have published 5 peer-reviewed journal articles from Disease WatchDog so far, and have a number more in the pipeline. Why is it so important to understand where these infectious diseases are cropping up? It is vital to know where diseases are occurring for several reasons - firstly because this is an indication often that 'herd immunity' is not sufficient in this area (this applies to infectious disease). Where this immunity is not sufficient (e.g. where we are not vaccinating enough) there is an increased risk for unvaccinated pets. If we can raise herd immunity in these regions then we can stop outbreaks and prevent future outbreaks from happening. It's also important to know where infectious diseases are occurring so that we can figure out what we need to do differently so we can try and reduce or even eradicate these diseases in the future. I firmly believe that diseases like Canine Parvo (that likely infects 3,000 - 5,000 dogs in Australia every year of which half of these may die) can be eradicated. Have the findings reinforced or challenged your views about the importance of vaccinating pets? There is still much research to do. Likely in many areas of science, we more we learn, the more we find out that we need to research further. Our findings to date certainly confirm that vaccination is vitally important and there are more areas than I could have imagined that animals are not adequately vaccinated and where disease outbreaks happen. I get to hear of more disease outbreaks than most people, and I am even shocked that there others occurring that no-one is talking about. The science of vaccination at a population level is a complex one and this is a topic that more research and better recommendations are needed in animal health. My friend and colleague, Dr Mark Westman told me about the project over a year ago and I was immediately interested. I think he actually approached me to see if Virbac could sponsor the project and provide vaccines, which we proudly do, but I was interested in being involved more personally as well. 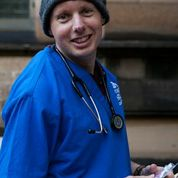 Dr Westman and a few friends who are also part of the animal health industry (vets and nurses) set up the charity to help provide veterinary support to the homeless and socially disadvantaged around Sydney. I have been volunteering for the Wayside Chapel (a homeless shelter in Kings Cross, Sydney) for a few years and I knew already that there was a great need for this kind of support. 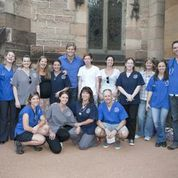 Pets In The Park is a registered charity, consisting of dedicated volunteers who give their time to provide veterinary care and preventative medicine as well as provide a social event for people in these areas (PITP meets and provides a free vet clinic once a month). They also provide a free desexing clinic which helps alleviate the pressure of unwanted puppy and kitten births from undesexed pets. Why is it important to provide treatment to this cohort of animals? These animals play a really important role in society - both personally (for their owners) and for society as a whole. It's funny, but the volunteers of Pets In The Park often comment that the pets that they see have a stronger bond with their owners than pets of other people in wider society. The clients of Pets In The Park would not uncommonly go without food themselves to feed their pets. Or they might travel long distances to provide the care that their pets need. On the other side of the equation, these pets provide a priceless gift to their owners - not only companionship (which can be hard to find when you are living on the street) but for people who may be having difficulties finding a reason to live, their pets can be that. Our pets can be our children, our confidantes and our best friends, and to many people, all of the above. Anything we can do to help support and maintain this bond is invaluable. Furthermore, these pets are at risk because of a lack of funding for medical and preventative care. 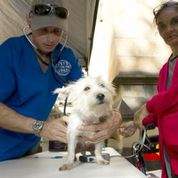 People living in lower socioeconomic areas are aware of the risk of disease (our research has proven a link between socioecomonics and Parvovirus outbreaks) and by targeting these pet populations for adequate vaccination, we can aim to not only protect these pets, but lower disease overall, and potentially stop seed cases that could start outbreaks elsewhere around the city or country. Being a preventative program, we may never know the true benefit of the work that we do. How can vets, nurses and students help out? 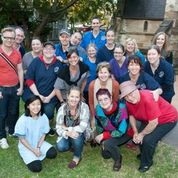 Anyone interested in helping out should check out the Pets In The Park website at www.petsinthepark.org.au and information on the charity and how to contact them is available there. The charity is looking for volunteers who can regularly attend their clinics and as more clinics are set up there will continue to be a need for volunteers. How can pet owners and members of the public help? The charity also has a gala ball coming up really soon - November 14th - and everyone is invited. Information on this is also available on the website. 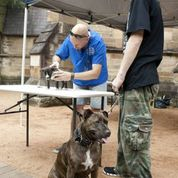 For any information or to contact Pets In The Park, go to www.petsinthepark.org.au. Thanks Dr Kelman for stopping by!